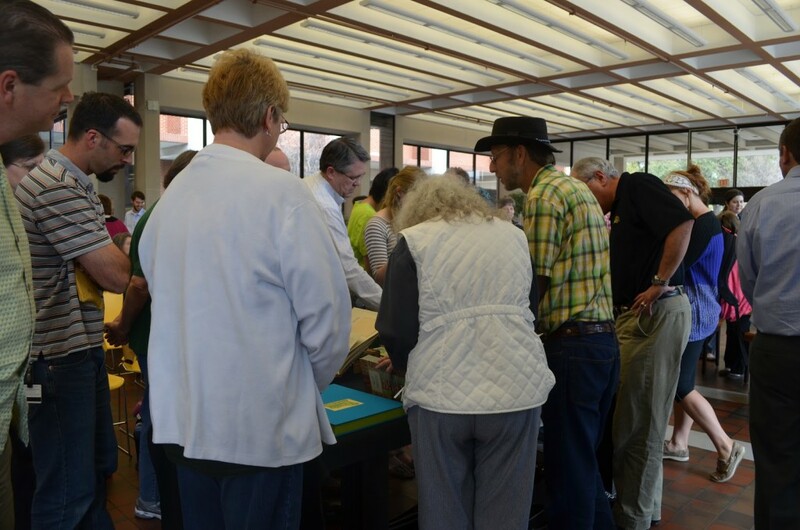 A curated exhibition on view September 1-29 at Tallyn’s Reach Library in Aurora, Colorado. Twenty-two works created by some favorite contemporary artists working in the book form. According to family lore, I fell in love with books as objects long before I mastered the memorization and subsequent actual reading of the Dr. Seuss books most frequently read aloud to me – Hop on Pop and The Cat in the Hat. The object of my first book romance was a cloth book with pages – Kay Clark’s All By Herself. 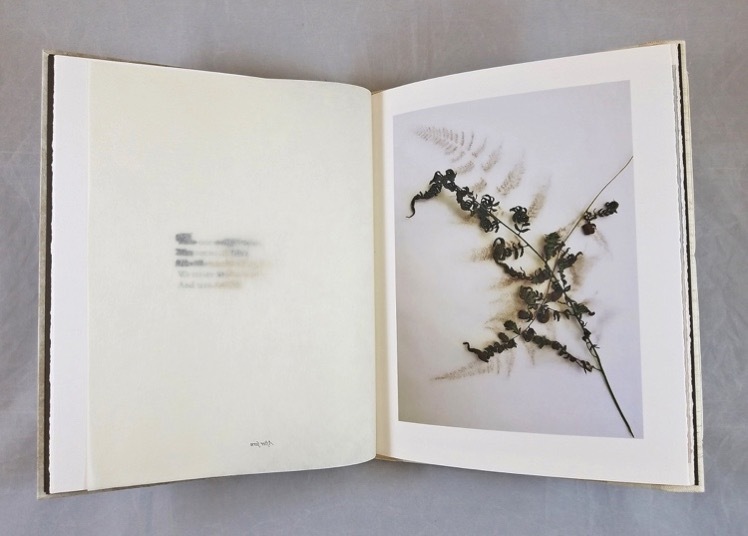 That book, with pages of shoelaces to be tied and untied, buttons to be buttoned and then unbuttoned, then buttoned up again, embodied much that continues to delight in the world of artists’ books. Words and images and interactivity. 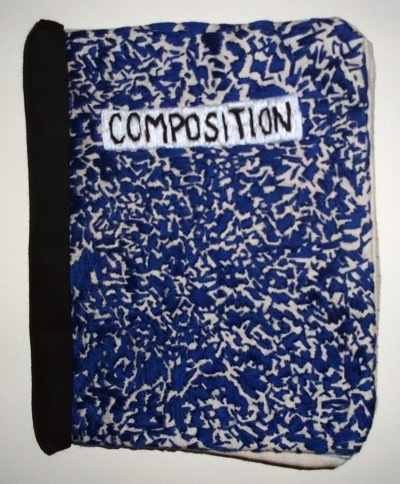 These days I have the honor and good fortune to work with artists making a variety of cloth books, such as Candace Hicks, whose embroidered book covers resemble those of another mid-twentieth century book icon – composition books. 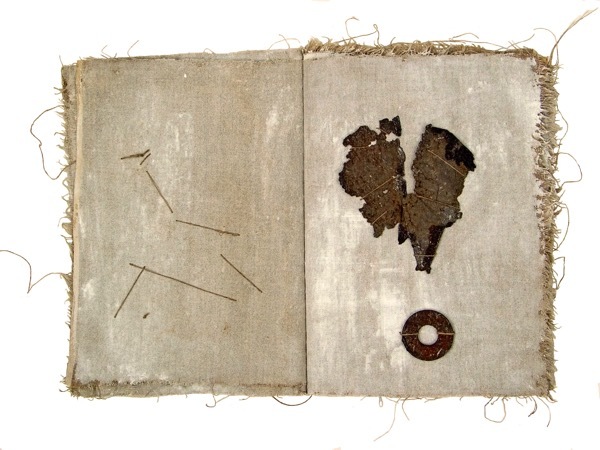 And Beata Wehr, whose cloth books incorporate objects she finds during her multi-continent travels, the stitches she uses to attach creating patterns that appear once a page has been turned. Representing contemporary cloth books in Word | Image | Object is Behind & In Front, a letterpress printed book by Penelope Anstruther. My childhood didn’t include a household television; instead we listened, as a family to full length readings on LP of classics such as Alice’s Adventures in Wonderland. Those stories were hard to enjoy in a room with restless siblings who pinched and prodded rather than, or perhaps in addition to, listening. I much preferred the Little Golden Book Read Along audio books and tapes that I could enjoy on my own. The act of listening to a previously print publication is explored in Macy Chadwick’s Observations on Listening. The exhibit also includes pop-up books (Carol Barton, Shawn Sheehy), richly colorful works (Sarah Nicholls, Barry McCallion, Ellen Knudson), books with texts beyond the expected (Denise Bookwalter, Laura Wait, Autumn Thomas, Islam Aly), books holding mysterious or magical objects (Dolph Smith, Mary V. Marsh/Tony Bellavar, Rebecca Chamlee, Rhiannon Alpers) and books that focus on telling a story (Lisa Rappaport, Sue Carrie Drummond). 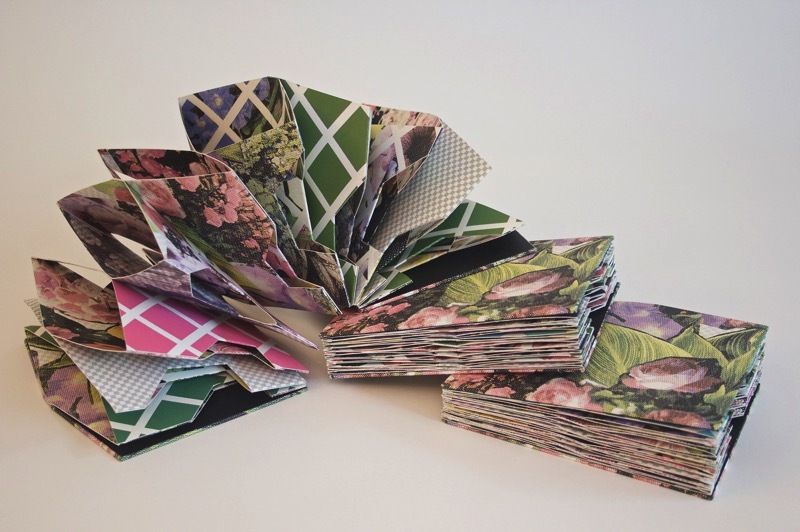 Ninth in an annual series of international exhibitions of contemporary artists’ books, Artists’ Book Cornucopia IX is hosted by Art Students League of Denver. 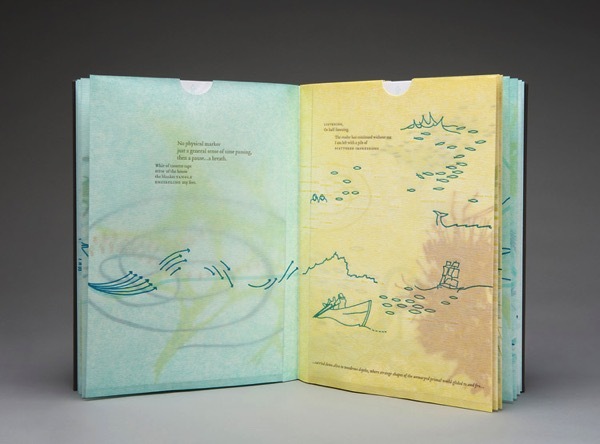 As in previous years, this year’s Cornucopia showcases a broad range of artists’ book works. From traditional, letterpress printed codex works to sculptural objects and one-of-a-kind editions, this exhibition is a cornucopia of engaging and intimate genres of artists’ book works, allowing the viewer a rare opportunity to examine the works up close as selected by juror Sha Towers, Art Liaison Librarian and Director of Liaison Services at Baylor University in Waco, Texas. Sha’s statement is found at the end of this post. It has been an honor to jury this international exhibition and I am grateful to Alicia Bailey of Abecedarian Artists’ Books for the opportunity. I’m delighted to share with you such a wide array of work by so many talented artists. 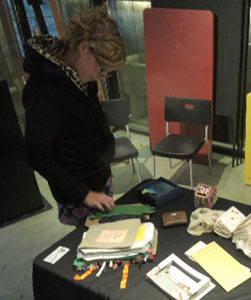 While jurying this work was very rewarding, it was also challenging as Artists’ Book Cornucopia IX drew an impressive number of entries, far greater than the exhibition space could possibly contain. What you see in this very competitive show is only the top thirty percent of a very fine field of work. 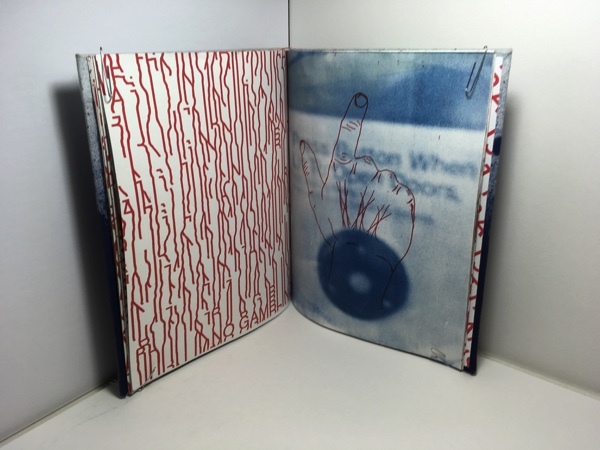 As the founder and curator of the Baylor Book Arts Collection, I have spent the past decade building a collection of artists’ books that now numbers more than 1,100 works. 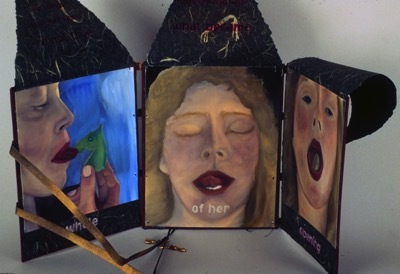 Through this collection, I have introduced thousands of students and community members to the world of artists’ books. 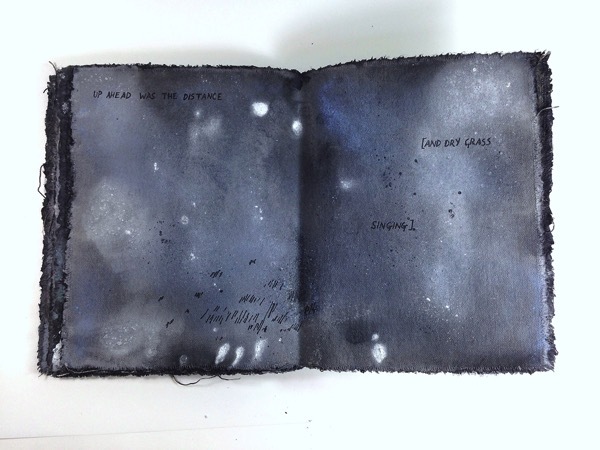 I often begin by asking them to consider “what makes a book a book?” and then as they engage with the artists’ books, to consider how these works challenge, expand, and enrich their understanding and their experience. My work as curator mirrors my approach as juror for this show. I’ve carefully considered each work’s conception and rendering, it’s medium and message. My desire for this show, much like the collection I’ve built, is to reflect and celebrate the many domains that make up the landscape of artists’ books. Here you’ll find a wide range of work that reflects, as well as challenges, the notion of what a book is. 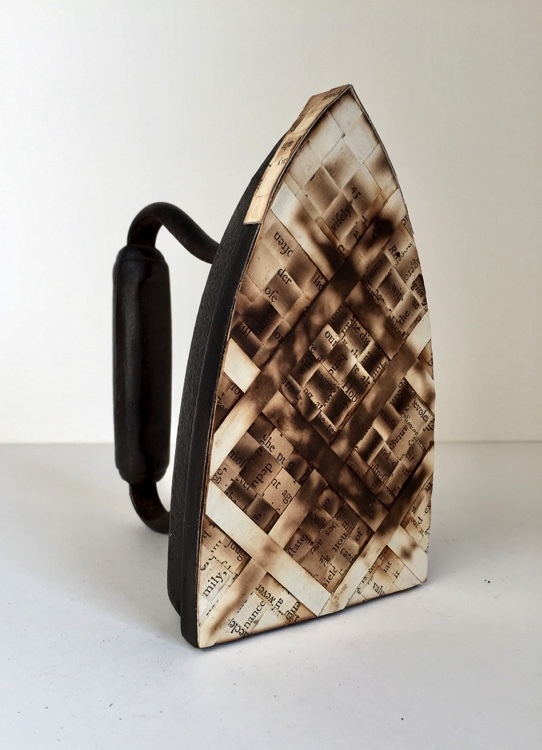 The work of these artists represents a cornucopia of materials, structures, and techniques as well as artists’ books that are traditional, abstract, narrative, sculptural, textual, photographic, letterpress printed, primitive, polished, simple, and complex. I hope that you’ll discover work in this exhibition that will challenge, expand, and enrich your own experience. Summer is a time for me to step back, re-assess Abecedarian’s successes and failures and develop new programming and relationships. One of the pleasures of this process is the addition of several artists to gallery inventory. This post introduces four artists who have Colorado ties. 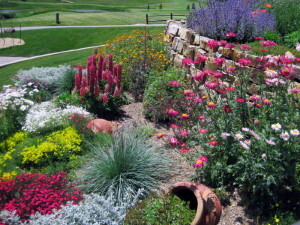 Nicole Cotten lived in the Denver area prior to getting a BFA in painting with a minor in creative writing from University of Colorado, Boulder. She is currently pursuing an MFA in book arts from the University of Iowa and is in the very early stages of what will likely be a successful focus on book arts. 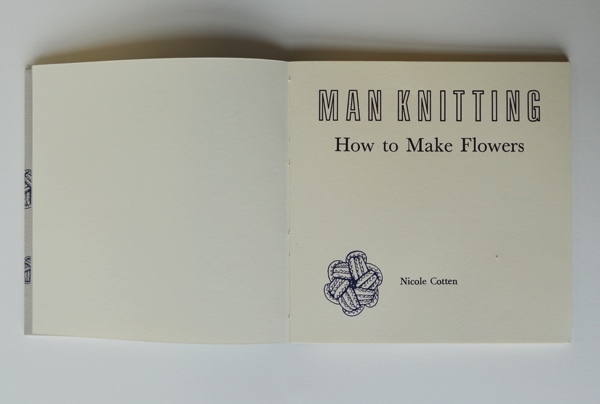 Click here to learn more about her book Man Knitting: How to Make Flowers (pictured below). 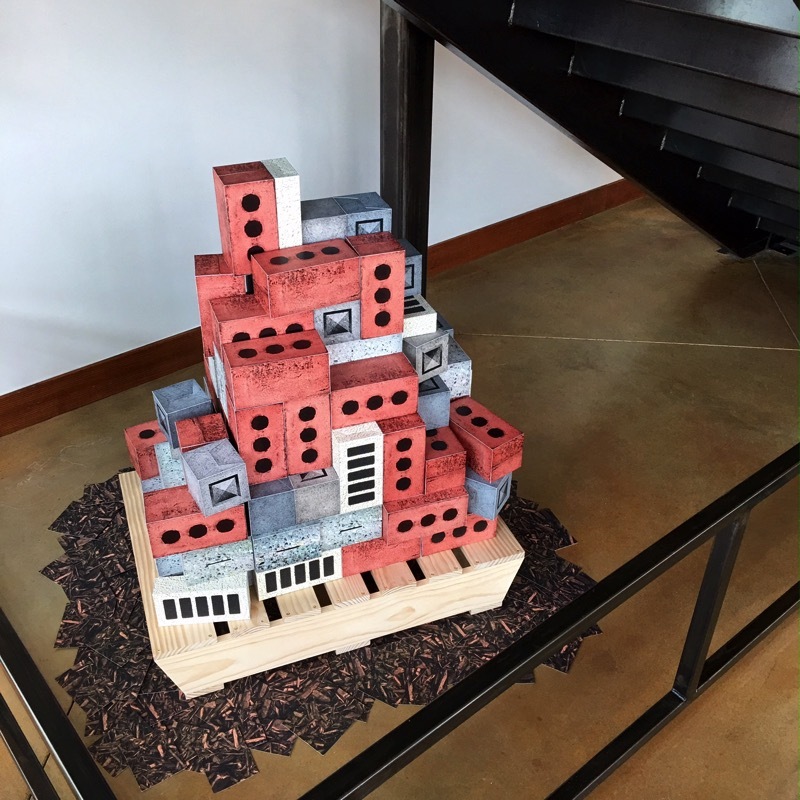 Scott McKinney is also just starting on his journey as a studio artist, having recently received his BFA in studio arts from Metropolitan State University in Denver. His work, Transit, has a deliciously tactile cover with a hand embroidered title. Click here to learn more about Transit (pictured below). 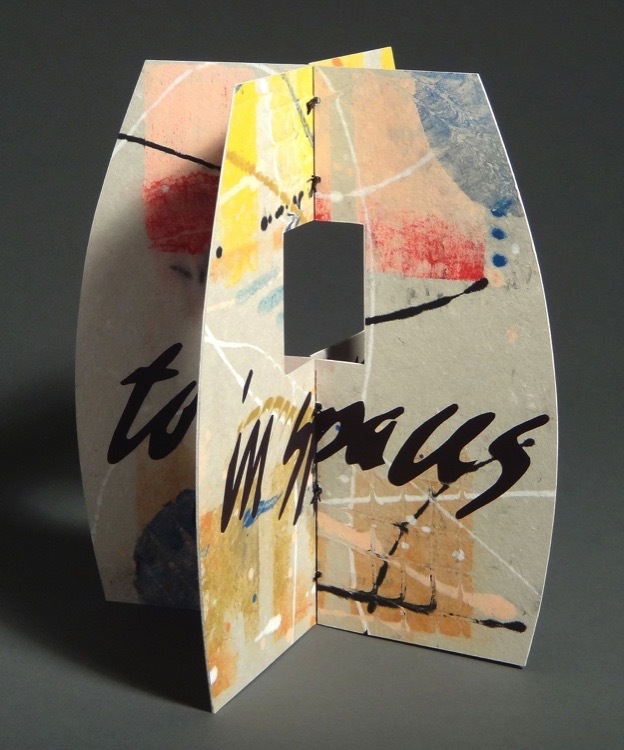 I’ve had Kim Morski’s work since it was featured in The Printed Page II exhibit earlier this year. 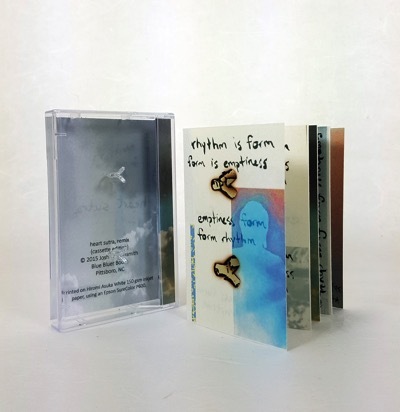 She moved to Denver several months ago and has already made quite a splash with her collaborative project Fresh Bread in March,and as guest artist in residence at the Art Gym. 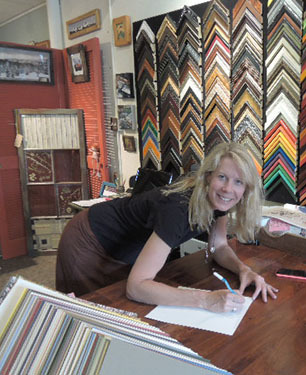 She has also jumped on board (as a new board member) at The Englewood Depot letterpress museum. Her book This Land is Your Land/This Land is My Land received a purchase award and is now out of print. Click here to learn more about Kim’s work in inventory. Part 2: Clouds is pictured below. Earlier this year I had an enthusiastic gallery visit from Suzy Royce Cruse, whose multi-faceted lifestyle gives her seemingly endless curiosity and interest in a broad range of topics. 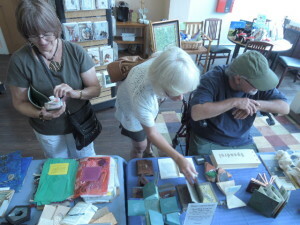 Suzy, a librarian by passion and training, creates one of a kind, sculptural book works and has been a gallery fan for many years. 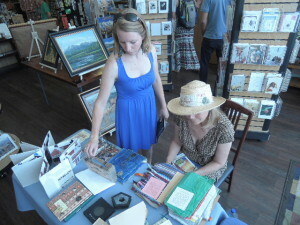 During our visit, she invited me to come to her town, Winter Park, Colorado, with my Artists Books on the Road project. I love Grand County and a visit to one of the communities in the area is something I’d hoped to work out. Winter Park is a town well known for its downhill skiing. Practically every kid I knew growing up in Denver, including my older siblings, took advantage of the Ski Train – a seasonal train operated by the Denver and Rio Grande Western Railroad from 1940–2009. 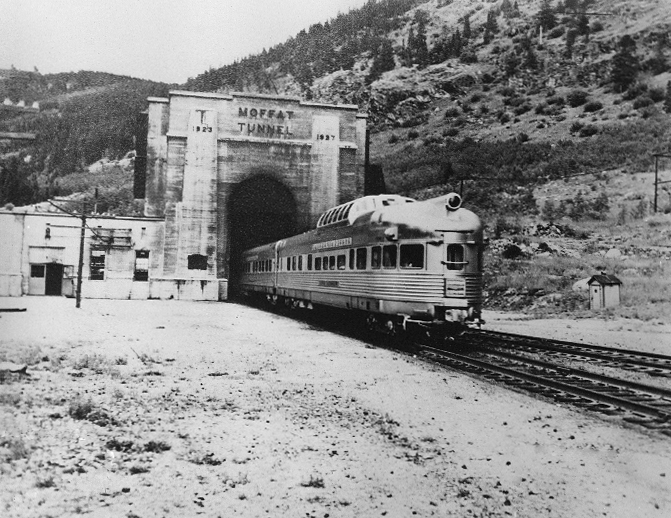 For nearly 70 years, The Ski Train left from downtown Denver’s Union Station and climbed 4000 feet, passing through 29 tunnels before reaching the final mountain underpass, the 6.2 mile long Moffat Tunnel. 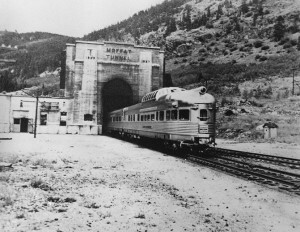 The Moffat is the highest railroad tunnel in the United States, and the third longest. Incredibly, it passes under the Continental Divide. The trains’ final stop was less then 100 yards from the base of the Winter Park Resort ski lifts. Sadly, the train, burdened with escalating costs, operational conflicts and the uncertainties posed by the redevelopment of Denver’s Union Station made its final run in 2009. Since then, there have been two successful promotional runs and if all goes well, periodic runs during the 2016 ski season are a possibility. Winter Park is one of several small towns in Grand County, where town-to-town resource sharing seems to have either been strategically implemented or naturally evolved. Other towns in the area include Fraser, Tabernash, Granby, Grand Lake, Hot Sulphur Springs and Kremmling. Buying groceries requires a trip to Granby or Fraser. The best all-round store for household goods is in Granby (and many claim the best breakfast is found in Granby as well); the county seat is in Hot Sulphur Springs. 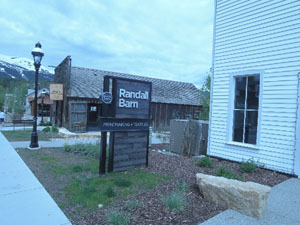 All of the towns except Winter Park and Tabernash have a branch of the Grand County Library District. Grand Lake is situated on the shores of Colorado’s largest natural body of water and is well known to mountain and water recreation enthusiasts as the western gateway to the vast and undeniably impressive Rocky Mountain National Park. So, although there is a long tradition of cattle ranching and hay production in the area, along with mining, the county now relies on tourism for economic survival. Unlike other communities I’ve visited, those in Grand County aren’t yet focusing on developing the arts as a significant future contributor the county’s economic well being. Suzy was the perfect hostess for Artists Books on the Road. 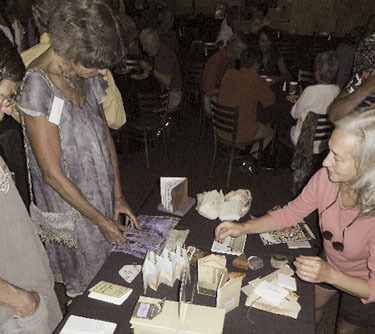 Working with Suzy in her capacity as co-host for an annual event Art Out of Thin Air (Winter Park, at 9100 feet is one of the highest elevations – and thus thinnest air – towns in Colorado), I arrived at Bistro 28 in Tabernash for the 7th Annual AOTA Member Show and Sale. The setting was beautiful; my tables were positioned near large windows looking out on magnificent views, and also near the double doors through which over 300 artists and art lovers arrived over the course of the evening. 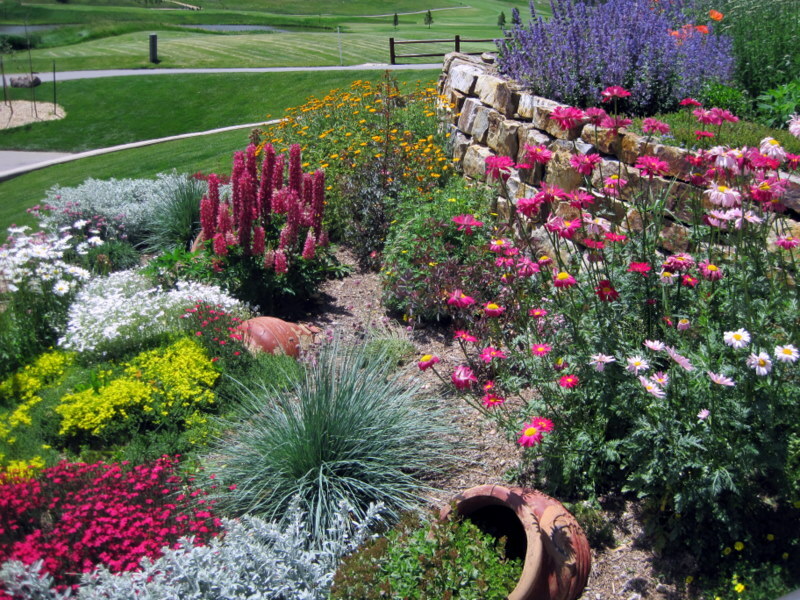 This is a remarkable accomplishment given the reality that, as is the case with much of Colorado, cultural events are in competition with outdoor recreation and, during summer tourist season, recreation is the focus for most visitors. 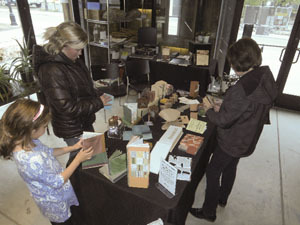 Throughout the three hours of the event, I showed artists’ books to dozens of visitors, a clear majority of whom were unfamiliar with the genre. The notable exception was Douglas M. Smith Jr., whose cousin is none other than Martha Wilson – founding director of the Franklin Furnace Archive, a non-profit organization in New York City. 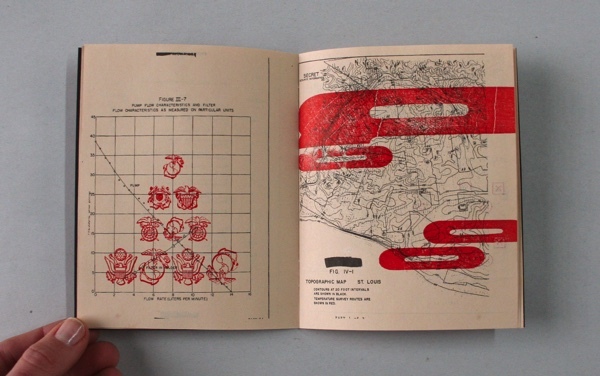 The archive’s admirable mission is to present, preserve, interpret, proselytize and advocate time-based visual art including artists’ books and periodicals. Thank you Suzy, all the artists of AOTA and Bistro 28 for including me in such a delightful celebration of visual arts at high altitude. The town of Salida, like many others, has jumped on the bandwagon of offering up art and cultural fare to boost the predominant town industry – tourism. Founded in 1880 by Denver and Rio Grande railroads, the town’s economic history includes the usual mix of industries: mining, quarrying, smelting, agriculture and retail trade—along with the usual smattering of saloons, gambling and brothels. More recenlty, Salida was named one of the top 3 small art towns in Colorado, and one of the top 30 in the nation in John Villani’s The 100 Best Small Art Towns in America. 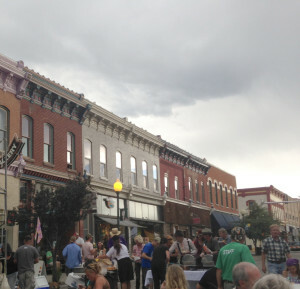 In 2012 Salida was named one of only two Certified Creative Districts by CCI, a division of the State’s Office of Economic Development. 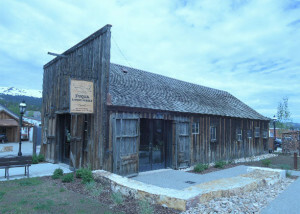 This was the same year that The Arts District on Santa Fe, where Abecedarian Gallery is located, was certified. There are now 12 Certified Creative Districts statewide. My visit to Salida with Artists Books on the Road was hosted by The Book Haven during Salida’s 23rd Annual Summer Art Walk, a three-day event in the historic downtown area. 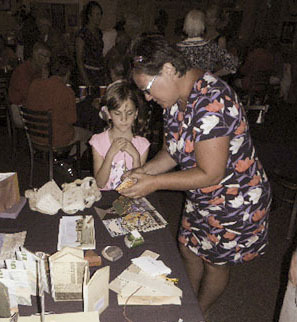 According the event organizers, over 100 venues were overflowing with new masterpieces and demonstrations. Speaking of the event organizers, it was a wonderful surprise to bump into Jimmy Sellers, co-organizer of this years’ Art Walk. Jimmy directs Sellers Project Space, located for many years in Denver, relocating last year to Salida. I’ve known Jimmy for years, he is a passionate and avid advocate of the arts; Salida is lucky to have him. 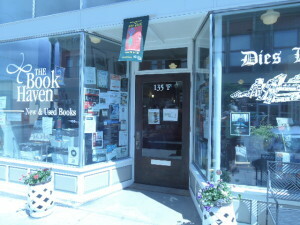 Setting up in an independent book store is always a treat; particularly so when it is as welcoming as The Book Haven is. Now in its 12th year, the well stocked but cozy store is owned and run by Lisa Marvel. 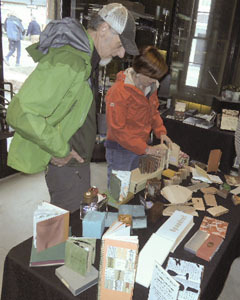 Regular customers and those dropping by for Artists Books on the Road made the afternoon lively, the visitors a rich mix of all ages, genders and nationalities. A predictable favorite for my visit was Lise Melhorn-Boe’s More Garbage. 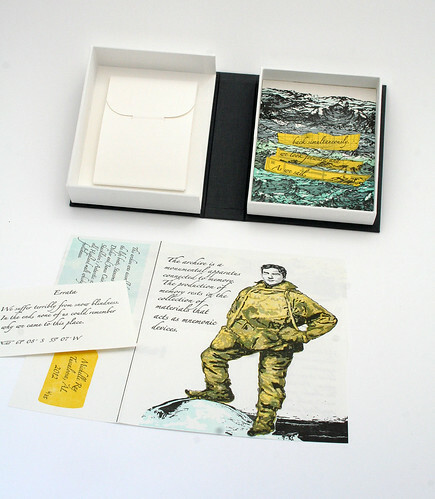 Lise creates artist’s books dealing with political, environmental, gender- and health-related issues. 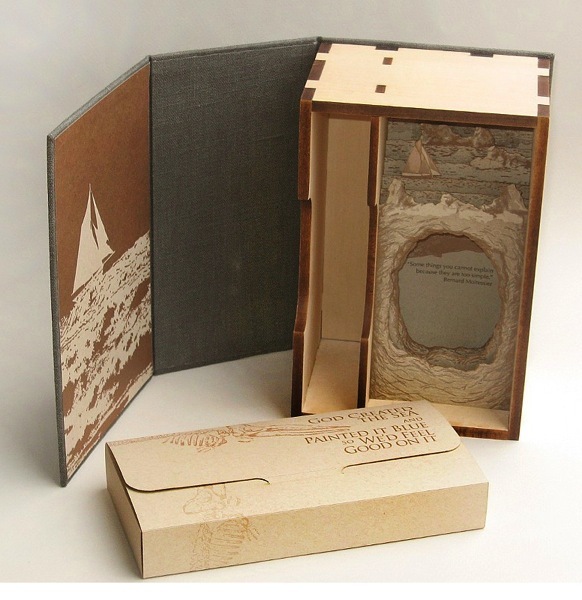 Her bookworks are sometimes funny, sometimes sad, but always thought-provoking. More Garbage, with is oversize, tactiley rich and colorful pages, beckons viewers in for a closer look. On opening and turning the pages, readers learn that we in North America throw out a huge amount of stuff, and much of what we dispose of is toxic. The texts, giving statistical details, are printed on left-over acid-free paper and hand-sewn to pages created from the artist’s garbage. After a day spent with books of all sorts, I was treated to an art’s district hosted barbeque held against a magnificent double rainbow, the town’s tame deer foraging nearby. BreckCreate hosts Hands on Artists’ Books during June Creativity Crawl. The ski resort town of Breckenridge, Colorado, at a lofty height in Summit County, about 90 miles west of Denver, is home to a well planned and lively downtown art district. Recognizing that developing a strong cultural profile as a means of expanding the town’s tourism industry beyond the winter months makes good business sense, the city has invested roughly twenty-five million dollars into the arts over the past few years. 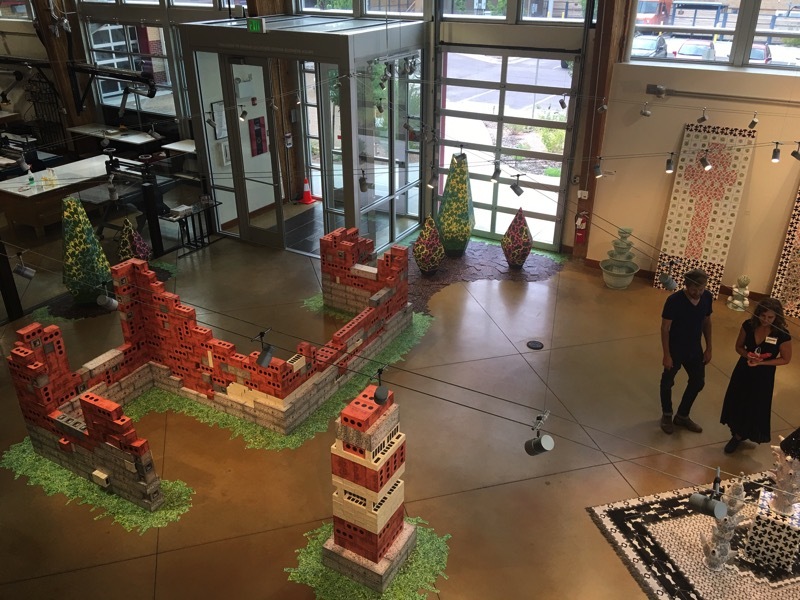 According to Jenn Cramm, BreckCreate’s Director of Public Programs and Engagement, the vision began in 2001, with the town’s purchase of the historic buildings for what is now the Breckenridge Arts District Campus. In 2014, the vision was more formalized with the designation of the non-profit Breckenridge Creative Arts (BreckCreate). In the past two years, the campus has been on a fast track of improvements and program development. June 13, the night I was in town, was the grand opening of the Old Masonic Hall as a newly renovated, dedicated space for the arts. 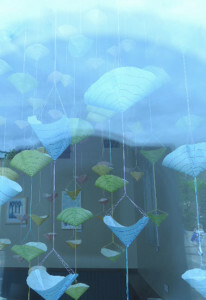 Pictured below is a view from the outside window of Jennifer Ghormley’s lovely hanging paper installation Transitions, with sky and downtown Breckenridge reflections. The campus, with studios and residences in renovated historic structures, hosts a variety of cultural programming throughout the year, including a national roster of visiting artists in two on-site residences. Special programming throughout the year includes second Saturday art walks, year-round workshops with visiting and local artists, visual art exhibitions, dance, music and theater performances and the quarterly Creativity Crawl. My visit was hosted in the front section of the Fuque Livery Stable, an open room with floor to ceiling windows on three sides and track lighting. 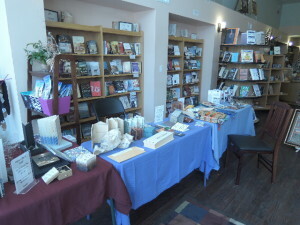 Over the course of the three hour Creativity Crawl, I showed dozens of books, spread out on three tables, to the 100 or so visitors who stopped by. 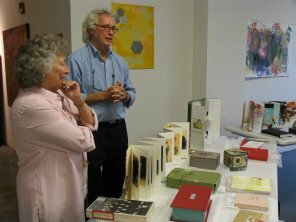 I am always surprised at how few visitors at events such as this are aware of the field of artists’ books. Many stayed to learn more, simply by looking at the books and asking questions about them. Several returned for a second visit, bringing along others they knew would appreciate the form. I love when this happens – watching the glimmer of interest (occasionally with a hint of reticence to engage) shift into full fledged involvement, enthusiasm and discussion. 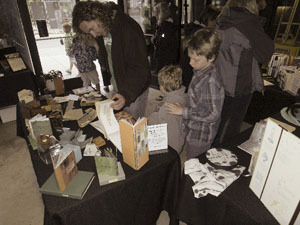 A lot of time, effort and expense goes into making these mobile artists’ books shows happen, for both myself and the hosting venue. 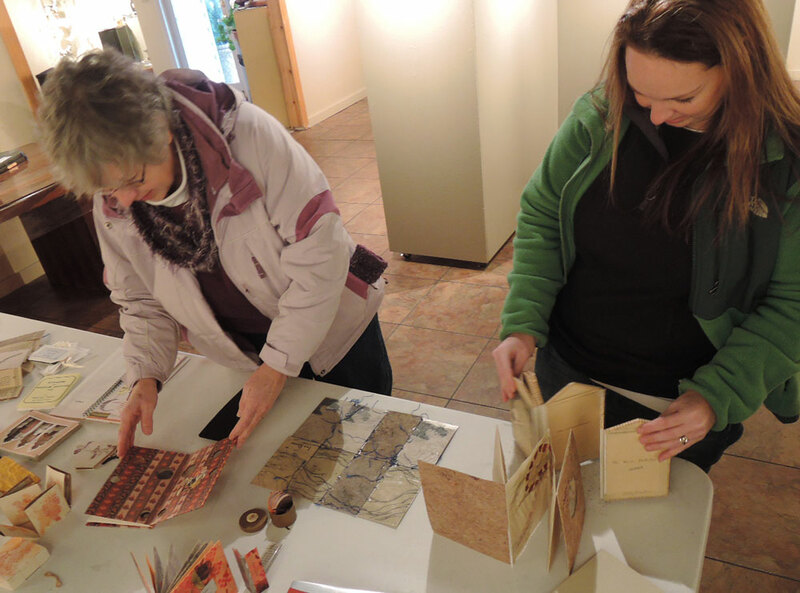 Getting to share the excitement that inevitably grows as visitors interact with books serves to affirm my commitment to Abecedarian Gallery and Artists Books on the Road. For librarians, collection development work often means combing catalogs and websites and placing an order without having seen the material in person. While this can certainly be a route to collecting artists books, another (more?) common route into library collections begins with an artist or dealer making an appointment with a librarian to show their work. 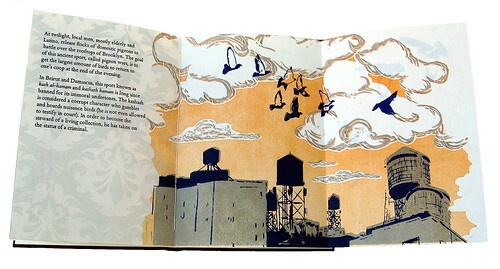 From my earliest experiences meeting with book artists and dealers, I remember thinking “Oh, I wish so-and-so were here to see this!”, so much so that in with the next few appointments, I invited other colleagues in the libraries to join in because I knew they would be intrigued with this medium. In a desire to “share the love” even wider, I began inviting some art faculty members to sit in on these appointments. 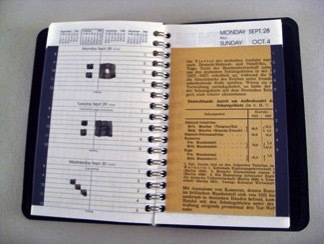 This generated interest in how book arts might be used in their courses and we soon began setting up appointments with artists and dealers to coincide with class times of specific art department courses so that the students could experience the works in something of an “open house viewing.” Such sessions grew into more formal presentations during visits with Bill and Vicky Stewart of Vamp and Tramp Booksellers. 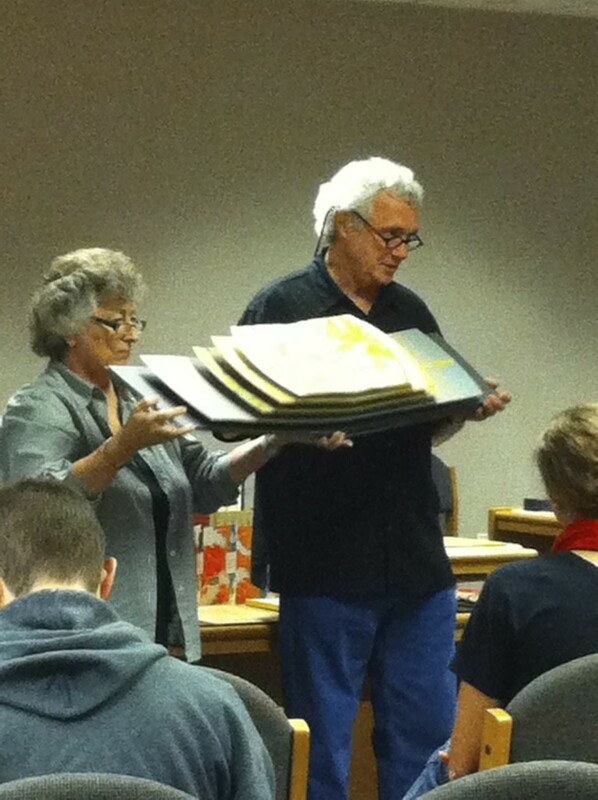 In these sessions Bill and Vicky would serve as artists book guest lecturers using as examples, items from the Baylor Book Arts Collection as well as new work that they brought with them, followed by an opportunity for students and faculty to explore the new works. I still used these visits as chance to review new work, but by inviting students and faculty join in on the experience and talk about which works they responded to, I was able to incorporate works that were particularly meaningful to them into our collection. This approach has strengthened connections between librarian and art faculty, librarian and students, faculty and collections, and students and collections. At Baylor, the book arts collection is used primarily as a teaching collection for studio arts. 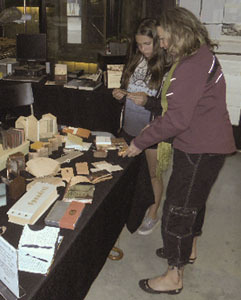 Individually or as a class, students use the collection as a source of inspiration for their own works as well as studying structural concepts or construction techniques. 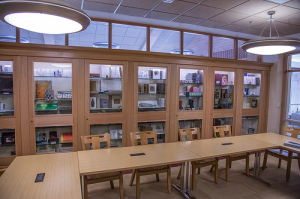 The earliest group encounters happened in the library, but as interest grew, I found myself needing to find larger and larger spaces as more than one section or course would gather for these encounters. As my goal was to involve more art students and faculty, I approached the department chair and museum director about holding the next encounter in the museum gallery (located within the art department). My favorite moment during this encounter was when an art student ran out of the gallery to go down the hall to find another of his instructors because he just HAD to show them this amazing artists book he’d just seen. Being in close proximity to all the relevant players definitely has advantages. For the next session, we moved the location to the foyer outside the gallery, which afforded much greater visibility and allowed for more classes to visit during the day. This location prompted a number of “drop in” faculty and students as well as a couple faculty members asking “can I bring my class that’s about to start?” Holding these events on “their turf” (instead of in the library) had a positive impact on attendance, departmental investment, and connections between the art department and their librarian. Connections were enriched not only with faculty and students, but also with administrative and museum staff. We’ve used these encounters as a unique opportunity for people to view much more work than they would ever have a chance to see on their own, especially since our collection budget could only allow us to acquire a tiny fraction of what’s available. Now I will rarely schedule appointments with artists or dealers that can’t be converted into an encounter for a larger audience. 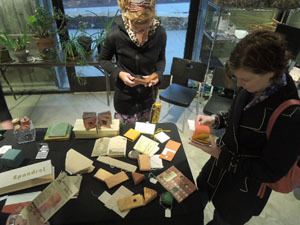 These encounters benefit the students and faculty by giving them direct involvement and ownership in building the book arts collection. They are more invested in the collection since they’ve had a hand in building it. They also see their librarian as in-touch with and responsive to their needs and it keeps me on their radar. Benefits to me as a librarian include more opportunities for networking with students and faculty, more buy-in for the collection and more support for additional purchases. I have a clearer sense of what types of works resonate with the collection’s users and because of this, use of the collection is growing. The next step in the evolution of these events moved to an even larger audience, taking what would have been a collection development appointment with a book artist Peter Thomas and turning it into a public event beyond the walls of the art department. 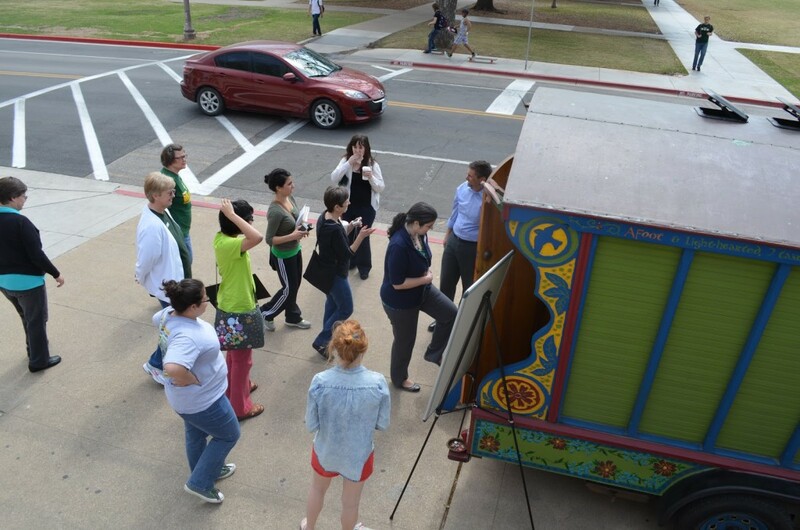 For this visit, Peter brought his gypsy wagon and parked it in front of the busy, main campus library (great advertising and promotion, by the way!) and then gave a public artist talk in the library foyer. 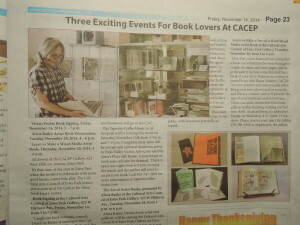 The event was advertised with posters across campus, front-page article in the campus newspaper, and on Twitter and Facebook. 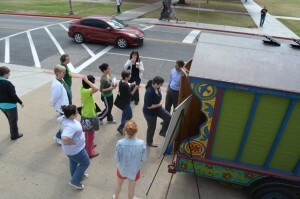 About seventy five people from the community and various parts of campus attended the talk, which was followed by a viewing of his artists books and his gypsy wagon. When I meet with students and faculty in these sessions, they see the perspective of librarian as curator and collector. When book artists and dealers are a part of the equation, the experience is greatly enriched with the perspectives of working professional artists, promoters, and people involved in the business end of the arts. 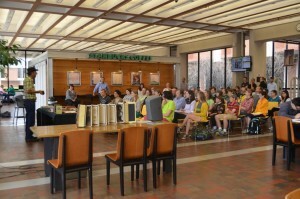 Peter Thomas, public artist talk event, Baylor University Libraries, 2013. Photos by Sha Towers and Carl Flynn. ShaTowers is the Art Liaison Librarian and Director of Liaison Services at Baylor University in Waco, Texas. 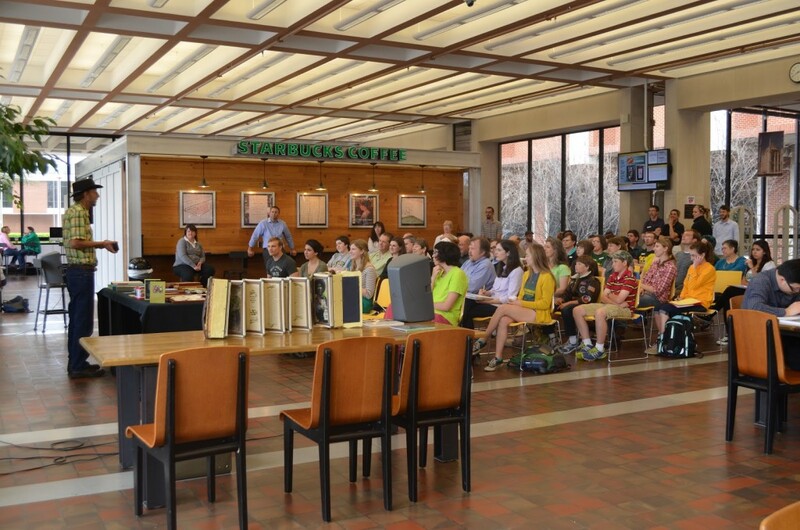 Prior to that he served for twelve years as the head of the Fine Arts Library at Baylor. He first encountered artists books in 2007, promptly fell in love with the medium, and began building a collection which now numbers nearly 600 works. He is also the Vice Chair/Chair Elect of the Texas-Mexico chapter of the Art Libraries Society of North America. 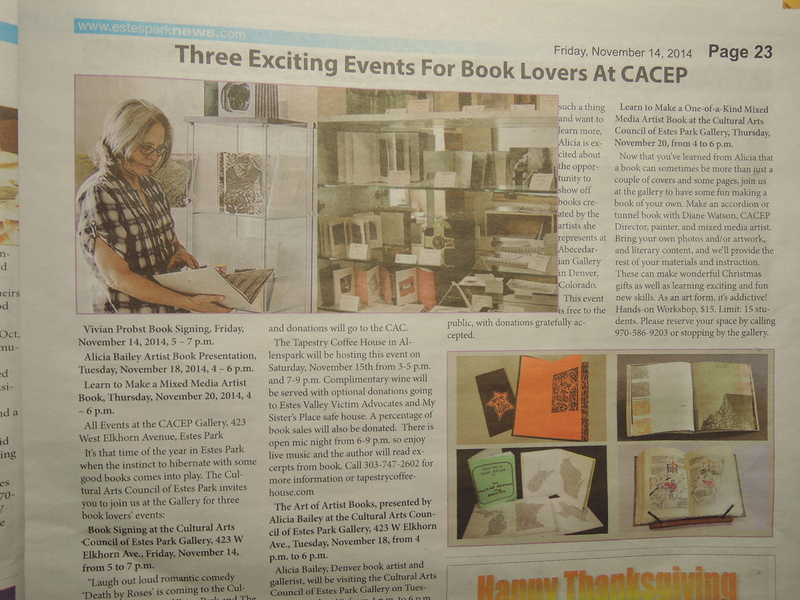 Hosted by the venerable Cultural Arts Council of Estes Park, Inc. (CAC), a non-profit founded in 1990, my first Artists Books on the Road presentation was hosted at the Cultural Art Center of Estes Park in November 2014. The community of Estes Park is primarily a summer resort town, well known as the eastern gateway to Rocky Mountain National Park. The area was hard-hit with a flood in September 2013 and during my visit, a year later, there is still evidence of post-flood damage and repair. Mid-November is quiet in this little community. Its a time when the instinct to hibernate with some good books comes into play; a perfect atmosphere for the contemplative activity of hands on viewing of artists’ books. 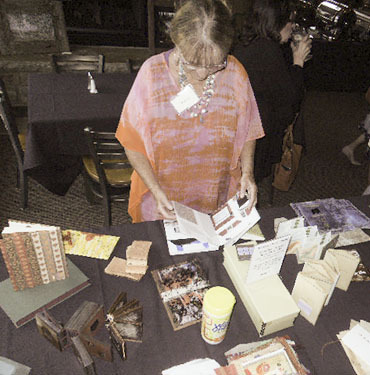 Using that to advantage, CAC put together a series of three book-lovers events – a book signing with Wisconsin novelist Vivian Probst, Artists Books on the Road and a mixed-media artist book workshop taught by Estes Park resident Diane Watson. 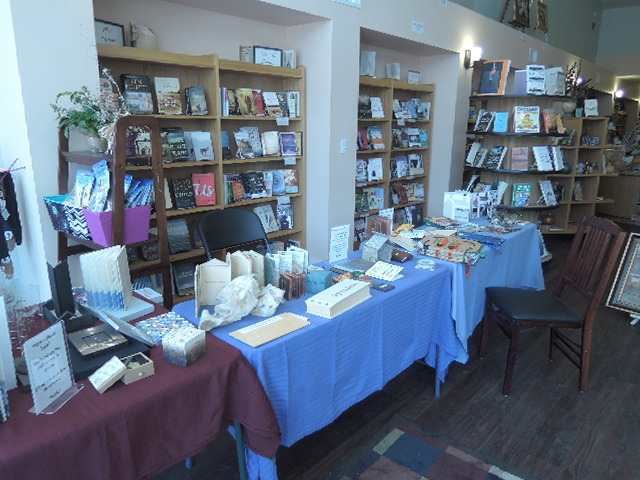 The inaugural event went well, above is a pic of the first two folks in the door, arriving mere moments after I’d unpacked some of the books.